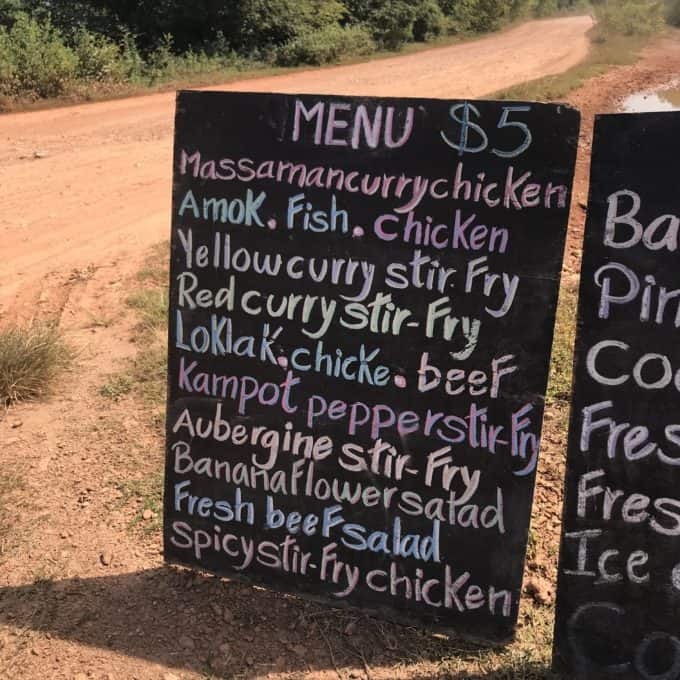 This Cambodia or Khmer beef salad was so easy to make and was the favorite at the cooking class we took at the Khmer Root Cafe just outside of Kampot, Cambodia in the rural countryside. Beef Carpaccio is one of all time favorite things so it no surprise that I absolutely loved this dish. Some people get a little concerned about eating raw beef however it is “cooked” in lime juice just like ceviche is. You do want to make sure you are using a premium grade beef however. 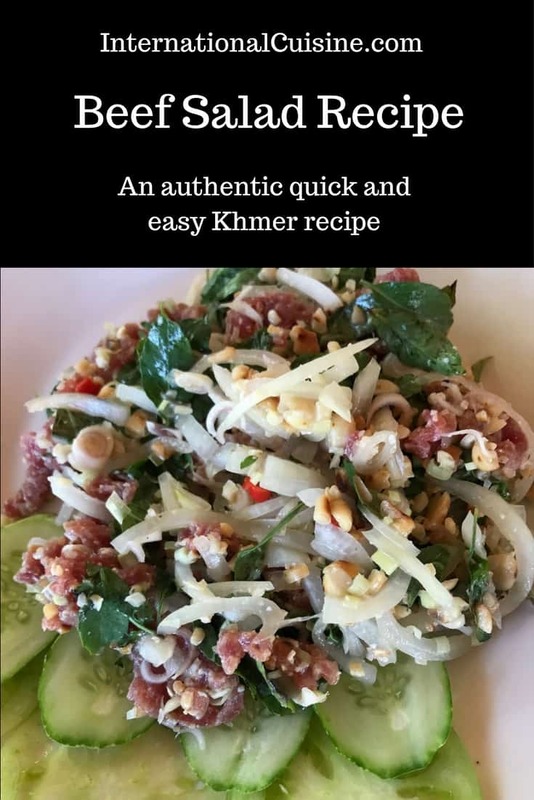 This Cambodia Beef Salad recipe is really quick and easy to make, the long time listed in the recipe is the time it needs to “cook” in the juices in the refrigerator. One of my favorite things to do while traveling is to take a local cooking class. Not only do you learn about the cuisine but the people and culture as well. We had such a blast with the French family that took the class with us and also getting to know the chef’s beautiful family. This particular class was one of the best on our travels. The setting was in an open air restaurant across from what is known as the secret lake. Villagers were cruising by with their water buffaloes and scooters. This recipe calls for tuk prahac which is a fermented fish sauce. You should be able to find it in your local Asian store or else you can simply substitute regular fish sauce. 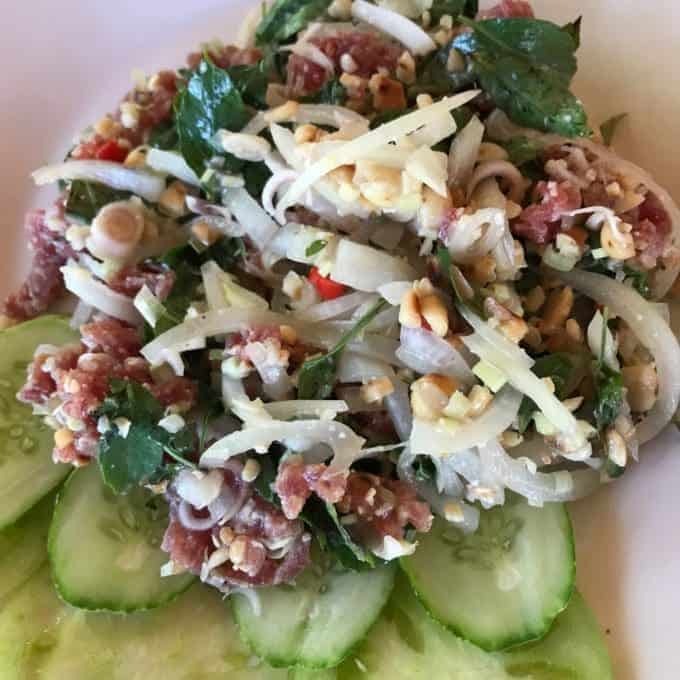 We made every single dish listed on the menu and this Cambodia beef salad was voted favorite among the participants in the class. I hope you make it, you will love it. A super quick and easy salad that hit all the notes that Khmer cuisine is famous for. Please note the recipe calls for about an hour or two in the refrigerator which is listed below as the cook time. Also you should be able to find tuk prahac at you local Asian market, otherwise substitute fish sauce. In a bowl, whisk 2 Tablespoons tuk prahoc with the juice of two limes and 2 tablespoons of the palm sugar, until the sugar has dissolved. Add the lemongrass, shallots, onion, basil and garlic and mix well. Toss in the slices of beef, cover and place in the refrigerator for 1-2 hours. Meanwhile, in a small bowl, whisk the remaining tuk prahoc with the juice of the third lime. Stir in the remaining palm sugar until it dissolves and set aside. Put the beef slices, drained of any remaining liquid in a clean bowl. Add the chili, and peanuts. Toss with the dressing, garnish with coriander leaves and serve immediately alongside some cucumber slices. Our Journey to Cambodia to get to know the country better.